Sweating is a natural process of cooling and detoxifying your body. And it’s an important feature of the body’s most unique organ: your skin. Nontoxic deodorant can be one of the last conventional products we switch over to natural. We understand the reasons people hang on to conventional deodorants and antiperspirants: we don’t want to look sweaty, smell stinky, or feel uncomfortably damp in our armpits. Unfortunately, your deodorant, and particularly your antiperspirant, could be interfering with your body’s natural attempts to remove toxins and could potentially be causing long term health effects like breast cancer or Alzheimer’s disease. Studies show that mothers who have used an antiperspirant containing aluminum salts (a common antiperspirant ingredient) absorb the aluminum transdermally and even pass the aluminum on to their children during pregnancy. Why switch to non-toxic, natural deoderant? Propylene glycol – common name: antifreeze. It is a hotly debated additive in personal care products carries a moderate risk of immunotoxicity and allergies. Why is this a big deal? Putting endocrine disruption chemicals directly on to our skin is a fast-tracked way to interfere with our hormones and suppress immune function. A great advantage to doing an armpit detox, besides that it helps speed up the natural deodorant adjustment period (ie you won’t stink up the room while experimenting with natural brands), is that it might help pull some of these chemicals out of the skin and tissue of the armpits. This can be especially helpful after years of conventional deodorant use. Just because your sweat may smell strong if you forget to put on your antiperspirant for one day does not mean that you shouldn’t try to ditch your antiperspirant. 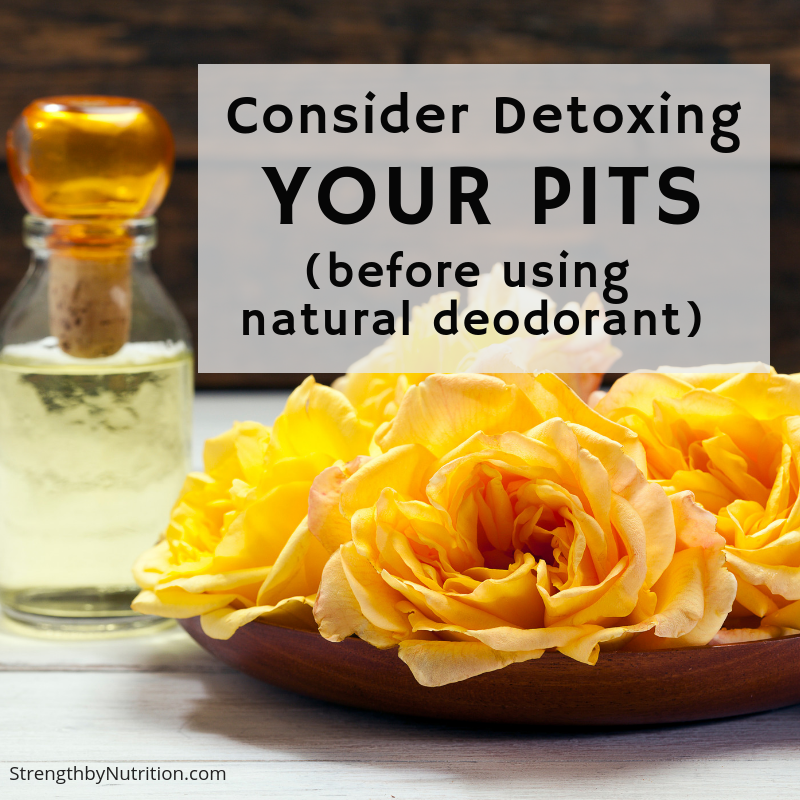 In fact, that’s a good reason to try to detox your armpits and transition to a nontoxic option! Once you correct the bacterial imbalances in your armpits, your sweat should not actually smell particularly unpleasant. Have you ever noticed that your sweat smells particularly strong when you wear certain shirts? Wearing natural fibers (versus synthetics) can make a huge difference in the smell of your sweat! Look for 100% cotton, linen, or bamboo rather than polyester, rayon, or other synthetic blends. Unfortunately, people tend to wear synthetic fibers when they’re sweating the most, during a workout. So wearing them for long periods or every day can contribute to bad bacteria overgrowth and upset your body’s microbiome. Certain foods will actually change the way your body odor smells. Consider testing the way foods can change your body odor, consider removing typical offenders like caffeine, alcohol, pork and foods fried in vegetable oils. I’ve personally noticed a decrease in smell after eliminating sugar! Choosing Organic foods will also help to decrease your body burden. Bacteria loves moist environments, which is why it can thrive so well in your armpits on a hot day (and produce odors). You can also dry off better after your shower. Also wipe off excess sweat with a paper towel if you want to keep your armpits dry and are not able to wash with soap and water (for example, while traveling, after exercising, or at your office). Staying hydrated can help remove everyday toxins in an efficient way and help to prevent body odor. Consider drinking safe, clean water for the best benefit (do this by going to EWG water database). If you’re looking to take your armpit detox a step farther, consider trying a clay mask. Our favorite mud mask with essential oils containing bentonite clay is doTERRA spa Detoxifying Mudmask. Primally Pure is another company making a great, nontoxic deodorant. They recently came out with a new and improved formula in really beautiful packaging! The new formula is fortified with kaolin clay (powerful detoxifier) and non-nano zinc oxide (soothes irritation + combats odor).We love their unscented and can’t wait to try the charcoal option! We love doTERRA Natural Deodorant infused with Cypress, Melaleuca (Tea Tree), Cedarwood, and Bergamot essential oils to create an effective, odor-fighting product for both men and women. These powerful essential oils inhibit underarm odor while leaving a fresh, clean scent.